Is it a native Russian doll or not? Well, first of all, there is no documentary proof that Matryoshka is not a native Russian toy. But there is also no evidence that it wasn't brought to Russia from Japan as the popular legend says. According to the legend, that first nesting doll depicted either a Japanese god or a monk named Fukuruma. The doll was brought to the Children's Education workshop owned by Savva Mamontov (or, according to other sources, by his brother). The workshop was located near Moscow, in Abramtsevo estate. Now, you might ask me, "Who is Savva Mamontov?" Good question! This is a well-known figure in Russian history. He was a famous Russian merchant, industrialist, entrepreneur and patron of the arts. In 1870 he (or his brother) bought the Abramtsevo estate and together with the best Russian artists founded an artistic union there. Those who love art have certainly heard the names of Ilya Repin, Mikhail Vrubel, Rafail Levitsky, Konstantin Korovin. Those were only a few of the great artists who joined the union. We do need to immerse a bit into the Russian history here. The end of the 19th century was the time of great economic, cultural and spiritual development in the country. People were trying to figure out a way that Russia needs to take in order to develop further economically, spiritually and culturally. Some thought that Russia needs to copy Europe, but others were sure that Russia is a unique country that needed to find its own identity and its own way of development. So the artistic union in Savva Mamontov's estate was working on a whole new trend in Russian art which was later called Russian style. The purpose of the Children's Education workshop was to make children's dolls highlighting traditional themes of Russian cultures. So, that little nesting Fukuruma doll caught the attention of Savva Mamontov as something unique and close to the Russian culture. Sergey Malyutin, who was a good friend of the Mamontovs' family and lived in their estate, got very interested in the Japanese nesting doll and decided to make a doll similar to Fukuruma, but he wanted it to have a distinct Russian style. He made a design of the doll and Vasily Zvyozdochkin carved the very first nesting doll set from the linden wood. After that Malyutin painted it with gouache. Gouache was a popular kind of paint in Europe in late 1800s. Since then the classical nesting dolls of Sergiev-Posad have always been painted with gouache. Now, as I've already mentioned, there's absolutely no proof that it happened this way! Many historians say that at that time there already existed a tradition of making "pisanki" for Easter in Russia. "Pisanka" is a beautifully painted egg. Some "pisanki" were made of wood, and at that time those eggs were often made the same way nesting dolls are made now -- you pull one egg apart in the middle and see something else inside. Here's the picture of the first nesting doll made by Sergey Malyutin. As you can see, it depicts an ordinary peasant girl holding a black rooster in her hand. The smaller dolls aren't just the copies of the big doll, but they depict other girls and boys. Maybe it's a family, and these boys and girls are all brothers and sisters? Or maybe the big doll is a young mother and all the other dolls represent her children? Nobody knows for sure, but I think it may be the case. Later in 1990, the Matryoshka was presented at the Exposition Universelle in Paris where it actually got a bronze medal. Russian matryoshka dolls quickly grew in popularity, so by 1911 they were being sold in over 14 countries. Until 1930s these dolls were made individually, so each matryoshka was a unique work of art, but later, during the Soviet Union times, the mass production of the toys started. In 1980es Russia opened its doors to the West, and the individually made matryoshka dolls started winning back their place in Russian culture and on the Russian market. Now nesting dolls didn't necessarily depict a woman in a traditional Russian costume. Some dolls had portraits or caricatures of Russian political leaders, famous musicians, sportsmen and other well known people. Nowadays nesting dolls are valued as unique pieces of art, like icons or paintings. Matryoshka? Seriously? What a weird name! It may seem unbelievable, but the first matryoshka didn't have a name. It got its name later, as the dolls gained more popularity. Actually, if you lived in the XIX century you couldn't think of a better name for a doll like that. Why? This question has a simple answer. Matryoshka is a derivative from the name Matryona. It was one of the most popular Russian names in the XIX century and it means "a noble woman." This name, in its turn, comes from the Latin route "mater" meaning "mother." The Russians associated the name with an image of a mother of a big family, a woman with perfect health and a full figure. Since the doll most often depicted a woman or a girl, it was only natural that it soon got the name Matryona, and Matryosha (or Matryoshka) was a diminutive form of it. Soon Matryoshka became a common name. Now you will hardly meet a Russian lady or a girl with this name, but at the same time everybody knows matryoshka dolls. A friend of mine who makes teddy bears always says that she doesn't really make them, but they are born with her help. She also firmly believes that handmade toys have a soul. If you ever held a nesting doll (moreover, if you ever played with it) you would also say that matryoshka dolls have a soul. They are born from linden wood, but some kinds of nesting dolls can also be made of balsa, alder, aspen, or birch. One set is made from a single block of wood. It is very important because different blocks of wood have different expansion-contraction characteristics and moisture content. If a set of nesting dolls is made from different blocks of wood, the dolls would simply not fit one into another. Some woodworkers start with the smallest figurine and make the other dolls of the set based on the size and shape of that smallest doll that can't be taken apart. But others prefer starting with the biggest doll in the set. So what are the main steps of the process? First the block of wood is cut in half. Then the master takes out a piece of wood off the top and bottom places. And he repeats the process until there's only a tiny piece of wood left. Then he carves them so they have a more or less oval shape and puts together the matching pieces so they can dry. The interesting thing is that there are no measurements taken in the process of making nesting dolls, so the result purely depends on the skill of the master. After that the dolls are oiled and one or more coats of starchy glue are applied to them in order to prepare them for painting. There are two main types of these dolls: traditional and "author's" matryoshkas. The author's nesting dolls are the ones made by professional artists. They can depict basically anything, from characters of a fairy tale to the portraits of Russian political leaders. Each artist tries to create his or her own unique pieces of art, which makes this type of nesting dolls increasingly popular. But if you want a "real" matryoshka then you probably need to dig a little deeper and find out about different kinds of traditional dolls. There are several types of nesting dolls made in different places, and each type has its own unique traits. Sergiev-Posad (or Zagorsk) is a small town located about 45 miles north-east of Moscow. It is famous for its Trinity St. Sergius Monastery. But dolls, including nesting dolls, are also playing a big part in the life of the town. In fact, it is considered to be the birthplace of nesting dolls because back in the XIX century that's where they started to make matryoshkas. So what did the first matryoshkas look like? The faces of first dolls were oval and had a strict expression. One of the distinct traits of those dolls was their big heads, but this disproportion actually made them more attractive as the painters were able to make the faces more expressive. The first matryoshkas of Sergiev-Posad had very realistic characters. Most of them were painted by students and artists from a local painting school. The nesting dolls depicted girls in colourful dresses holding different things in their hands, like flowers, baskets of fruit etc. Modern matryoshka dolls from Sergiev Posad feature not just traditional characters, but can follow different themes depicting Russian political leaders for example, or even cartoon characters. In 1918 Sergiev-Posad saw the opening of the Museum of Russian and Foreign Toys. You can still see the first Russian matryoshka made by Sergey Malyutin there. And soon afterwards, the Toys Research institute was opened there. In this institute they created the most unique and remarkable matryoshka dolls. In 1967 the 60-pieces nesting doll was made there, and it is still considered one of the biggest nesting dolls made in Sergiev-Posad. There is still a doll factory in Sergiev Posad producing high quality nesting dolls now. However, Sergiev-Posad is not the only place famous for its matryoshka dolls. In fact, there are at least three more places that played a huge part in the history of nesting dolls. And that's how it happened. At the end of the XIXth century the popularity of Russian nesting dolls grew so fast that Sergiev-Posad's icon painting school couldn't possibly satisfy the growing demand. So new manufacturers emerged, and in a few years almost every family in Sergiev-Posad made matryoshkas. Even children and old people helped in the process. And since the nesting dolls making business was very profitable it was only natural that people in other towns and villages started making their own matryoshkas. One of the largest nesting dolls making centers was in the town called Semyonov, near Nizhny Novgorod, and in Polkhov Maidan (or Polkhovsky Maidan). So let's find out more about those new Russian art centers. Semyonov is a small town located near Nizhny Novgorod city right where the Oka meets the Volga River, just 260 miles east of Moscow. The tradition of making nesting dolls here started as a family business, but it grew more and more popular with time. In 1931 a separate group of craftsmen was established there which made different Russian dolls and souvenirs including matryoshkas. A few years later Semyonov nesting dolls became more famous than the classical Sergiev-Posad ones. 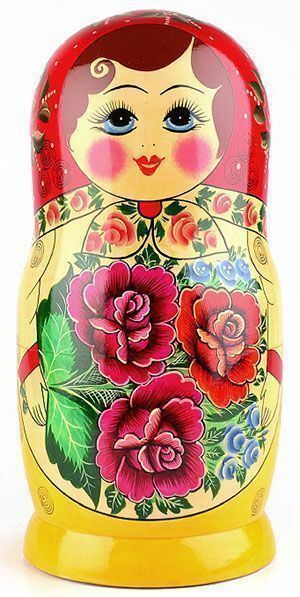 Even now, if you ask people what image of a doll comes to their mind first when they think of a matryoshka, they would often describe a doll very much like the one made in Semyonov. Red and yellow are the primary colours used to paint these nesting dolls, so you can imagine how bright they actually are. The painters of Semyonov made their matryoshkas in a more symbolic style than the artists of Sergiev-Posad. Besides, unlike the first creators of nesting dolls, the craftsmen of Semyonov used aniline dyers and they left a lot more blank spaces while painting their dolls. These matryoshkas were a bit more slender and had a wider bottom compared to the Sergiev-Posad ones. As you can see, it usually depicts a woman with dark hair in a red or yellow shawl on her head. But the most important thing in painting Semyonov nesting dolls is their apron. If you look closer at the picture you'll know why. It has a beautiful bouquet of roses painted on it. 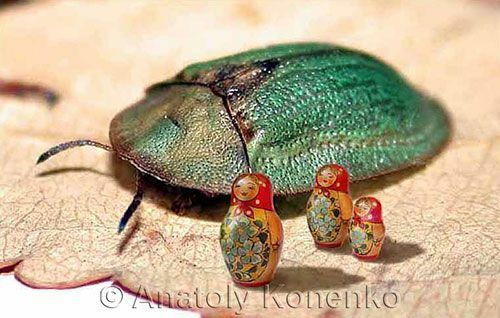 That's why these nesting dolls are also known as Red Roses nesting dolls. According to the tradition, the flowers are not painted in the center of the apron, but a bit to the right. It is also interesting that Semyonov nesting dolls are made of birch, not linden like the Sergiev Posad ones. Another reason why the nesting dolls made in Semyonov are so famous is the number of dolls in each set. These dolls often contain many pieces: typically 15 to 18, or even 20. There are even some records associated with these dolls, but we'll speak about them a bit later. Back in the 1980-es the artists from Semyonov started making new types of nesting dolls. For example, there was a nesting doll set called "The Father Frost and Snow Maiden" designed for small children who needed to learn to count to 10. So inside the big matryoshka 10 little dolls were hidden. Polkhovsky Maidan, a small town located to the south-west of Nizhny Novgorod, not far from Sergiev-Posad and Semyonov, has long being known for its marvelous woodworkers. 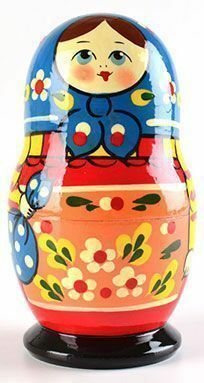 In 1930 the first matryoshka was made here, thus starting a new tradition and a new style of matryochka dolls. At fist the artists copied the style of Sergiev-Posad, but soon they stopped using gouache and started to use aniline dyers like the artists from Semyonov. 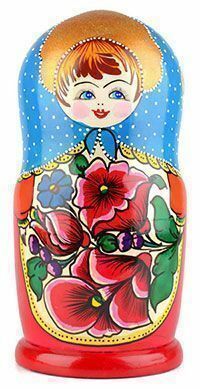 Besides, with crimson, yellow, green, violet and blue colours used together, Polkhovsky Maidan matryoshka dolls were even brighter than the Semyonov ones. The Sergiev-Posad nesting dolls were very realistic, the Semyonov ones were symbolic, and the Polkhovsky Maidan matryoshkas were painted in a style that resembled children's work. Maybe that is the reason why kids love these nesting dolls so much. Another unique trait of the Polkhovsky Maidan nesting dolls is the "inking," i.e. making the edges black. Like the artists of Semyonov, the craftsmen of Polkhov Maidan paid special attention to the apron and its floral ornament. They often painted dog-roses with many petals. The dog-rose has always symbolized femininity, love and motherhood. Some artists added other elements like green leaves and rose buds to the picture. That's why the dolls from Polkhovsky Maidan look so beautiful and bright. Even now Polkhovsky Maidan continues to produce nesting dolls that compete with Semyonov and Sergiev-Posad dolls in popularity and style. The first nesting dolls were made in Vyatka region in the beginning of the XXth century. The first mention dates back to 1924. However, Kirov local history museum has only one matryoshka doll made in the beginning of the XXth century. It depicts a girl in a red skirt, blue blouse and green shawl. Historians say that in 1930s there was a temporary decline in the interest towards matryoshkas. No wonder we don't see a whole variety of dolls from those years. The situation started to change in 1937, when in Vakhrino and Ovcharnoye villages the first craftsmen union called "Artel Progress" was established. The union made sports equipment, kitchen and school supplies, and toys, including wooden matryoshkas. In 1938 they started producing theme nesting dolls. The artists painted their matryoshkas with oil colous. The dolls mainly depicted young smiling girls wearing floral shawls and traditional sarafan dresses and holding a bouquet of wild flowers. In 1958, during the International Brussels Exhibition the world saw Vyatka nesting dolls for the first time. 10 years later, in 1968 the artists started using aniline dyers. Bright colours and attention to details totally transformed the look of Vyatka nesting dolls. Though matryoshka dolls were still considered toys, the focus in making them shifted more and more towards making it an art object and an interesting souvenir. 1. When you look at your matryoshka doll, you see a rather small piece of wood and you can't imagine that it literally takes years to make it. Timber that is necessary for making matryoshka dolls is cut down in early spring. The logs are put in piles with gaps between them, so the air can circulate there. And they are kept drying for several years until they reach necessary condition. Only a highly skilled master can see whether the wood is ready for the manufacturing process or not. "The largest set of Russian dolls is a 51-piece set hand-painted by Youlia Bereznitskaia (Russia). The largest measures 1 ft 9.25 in (53.97 cm) in height, the smallest 0.125 in (0.31 cm) in height. The set was completed on 25 April 2003. When all 51 pieces are lined up together touching, they measure 11 ft 2.25 in length." Youlia Bereznitskaia, the holder of a new record, comes from the USA. So her nesting doll belongs to the "author's" category, not the traditional one. 4. The biggest nesting doll made in the USSR was as tall as a 7 year-old girl, and the smallest nesting doll had the size of a pea. 5. The process of making nesting dolls if one of the most environmentally friendly processes in the world. The seasoning of the wood takes a lot of time, so when the wood is ready for turning, the craftsmen try avoid waste as much as possible. Often, if some wood is left, they make other smaller toys or souvenirs with it. The highly skilled professional painters working with matryoshkas also make sure there's very little paint or lacquer waste. 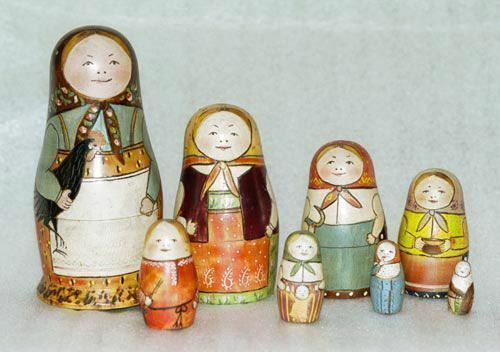 The biggest nesting doll in this set is 5 mm tall, the next one is 4 mm tall and the smallest one is only 3 mm tall. Some sources say that he made a 4-piece set with the largest doll being 5 mm tall and the smallest one being only 1.1 mm tall but there is no picture of this set in his official website.